Sept. 24, 2008 | "You can be whoever you want to be," says an inviting Phil Tuchman. "You can be a beggar or a millionaire. A mom or a husband. Whatever. You decide!" I volunteer in political campaigns now and then. After a series of outings for Obama and a first mission as a phone banker for John McCain, I returned to McCain's headquarters in Arlington, Va. The offer was too alluring to delay -- they wanted to put me into action as a ghostwriter. 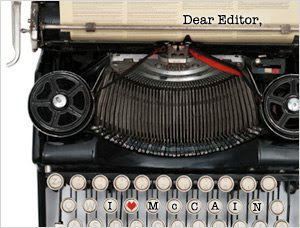 Next to commercials and phone banking, writing letters to the editor is the most important method of the McCain campaign to attract voters. At least that is what's written in the guidelines that McCain campaign worker Phil Tuchman presents to me. Today he is training six ghostwriters. What on earth is the appeal of McCain for the former Soviet bloc? Last time I was here, an exuberant Polish guy was phone banking next to me. Today, a Russian in yellow suspenders is shimmering at the same table, looking just like an actor who is famous in the Netherlands for star turns as a genius who suppresses his dark side with painstaking self-control. The assignment is simple: We are going to write letters to the editor and we are allowed to make up whatever we want -- as long as it adds to the campaign. After today we are supposed to use our free moments at home to create a flow of fictional fan mail for McCain. "Your letters," says Phil Tuchman, "will be sent to our campaign offices in battle states. Ohio. Pennsylvania. Virginia. New Hampshire. There we'll place them in local newspapers." "With Sarah Palin, I have even more reason to trust in victory. She represents my heart." Hmm. Does that sound like total doublespeak? Or does it sound like logical reasoning to a McCain supporter? I cannot come up with anything better. "Sincerely ..." I leave the dots for somebody else's signature. Does Phil Tuchman want to read it? Phil bends over my computer screen and reads. This takes a while. I am expecting roars of laughter or to be kicked out. Then he says drily: "I like that. It appeals to the hearts of people. Can you write more letters?"